By 2040, every fourth child on the planet will die or suffer from diseases associated with acute water shortages. Such a warning to the world community was voiced by the representatives of UNICEF – the United Nations Children’s Fund – in its new report “Lust for the Future”, timed to the World Water Day, which is celebrated today, on March 22. The authors of the report described a very gloomy picture of the next several decades: the growth of the world’s population, a sharp increase in demand for water, sea level rise and more and more frequent droughts in aggregate will lead to a crisis of epic proportions. To date, 36 countries around the world have faced “an extremely high level of problems related to water shortages,” the organization’s report said. Every day, more than 800 children under the age of five die from diarrhea due to lack of clean water and poor sanitation in which they have to live. For the same reasons, about 156 million children under the age of five are lagging behind in psychophysical development. In the foreword to the report, Professor Anthony Lake, Executive Director of the United Nations Children’s Fund, stressed that water is the primary and most important element of life on Earth. “Without water, nothing can grow. And without safe water, children can not survive, “- said the professor. “Children who do not have access to clean water are more likely to die in infancy – and in childhood – from diseases caused by waterborne bacteria, to which the smallest child’s organism is most vulnerable. If these diseases are not immediately killed, they help delay the growth of the child’s body and intellect, and also strike a blow to their future, undermining their ability to absorb nutrients, “said Anthony Lake. The UNICEF Executive Director stressed that the reasons that prevent children from accessing clean water are many, ranging from droughts and floods to armed conflicts, which violate the water infrastructure of countries. As an example of countries where this problem is most acute, Anthony Lake brought Nigeria, Somalia, South Sudan and Yemen. In these countries, about 1.4 million children are already at risk of dying from acute water shortages and malnutrition. In Ethiopia alone, in 2017, according to UNICEF projections, more than nine million people will remain without clean drinking water. According to the information provided in the report of the organization, by 2050 due to population growth the amount of water per person on the planet will be halved. But the same concerns about the experts are caused by the consequences of global warming. According to them, since global warming will lead to an increase in the rate of evaporation of water and a decrease in precipitation in many regions, such as the Middle East, water supplies will become even scarcer, especially during the hot season. Thus, the UNICEF report states that a rise in temperature on the planet will lead to an increase in water volumes in the atmosphere, which will significantly reduce the availability of water on land, especially in the warm months of the year. As the atmospheric air cools down, more intense precipitation will fall out, that is, the frequency and intensity of powerful tropical cyclones and other extreme weather events will increase. In addition, rising sea level can lead to the fact that fresh water will get a large number of salts, which will make it unfit for drinking. Meanwhile, about 25 percent of the world’s population lives in the lowlands and small islands that are most vulnerable to this danger. As a result, according to estimates by the UN Children’s Fund, in 2040 almost 600 million children (that is, every fourth child of the planet) will live in areas with extremely severe water shortages. 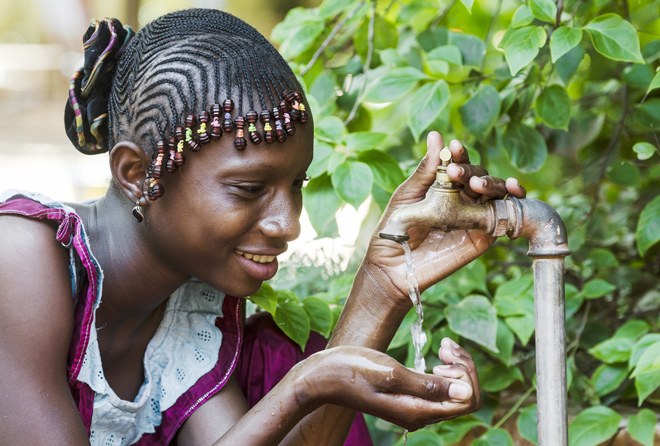 UNICEF recommends that the leadership of all countries give priority to ensuring access to clean water for the most vulnerable groups of the population – children, and to increase the volume of operating reservoirs, through public policies in the field of water supply and sanitation, to reduce climate risks and encourage local enterprises to work to prevent Pollution and depletion of clean water.